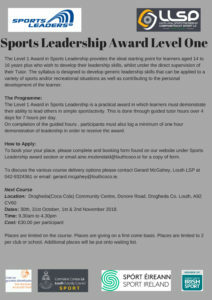 We are delighted to announce the launch of our Sports Leadership Course on 30th 31st October, 1st & 2nd November 2018 in Drogheda Community Centre (Coca cola building, Donore Road). 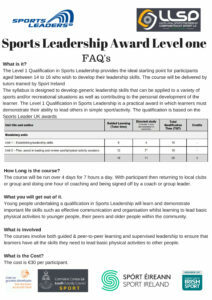 The Level 1 Award in Sports Leadership provides the ideal starting point for learners aged 14 – 16 years who wish to develop their leadership skills. Fee €30.00 per participant.